British Columbia’s marine life is amazingly rich. In fact, most of BC’s overall biodiversity occurs in the ocean. 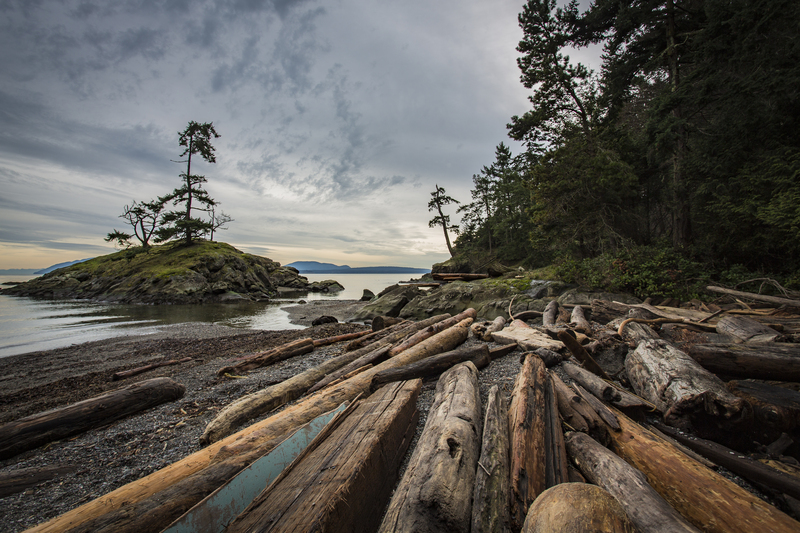 Yet while more than 15% of BC’s land has protected status, only 3.2% of our marine environment is protected. At the same time, many marine species are in steep decline or at risk. What’s needed is a network of marine protected areas (MPAs) along the BC coast, to help conserve marine plants and animals and the habitats on which they depend. MPAs are like an “insurance policy” — a smart investment to guard against errors in fisheries management or the impacts of environmental changes such as climate change. Overall size and protection levels within MPAs may vary. It’s important that we create MPAs for every type of marine habitat, since each type supports a different set of fish, shellfish, birds and other species. At the very least, oil, gas and mineral exploration and development, dredging, dumping, bottom trawling and open netcage fish farming should be prohibited in every MPA. Beyond this, MPAs should include a “no-take” zone (closed to fishing or other harvesting), to allow fish and other animals to grow to maturity and reproduce. From studying existing MPAs worldwide, scientists have learned that no-take zones help to increases species diversity, sizes and populations — both inside and outside the no-take zone. Humans have caused a great deal of damage to our world’s oceans. But fortunately, along with the ability to cause harm, we have the ability to heal. Creating a network of MPAs could buy us the time we need to learn to properly safeguard our amazing marine resources. Since 2003, Parks Canada has been conducting a feasibility study to create a National Marine Conservation Area (NMCA) in the southern Strait of Georgia. NMCAs are a form of protection under the National Marine Conservation Areas Act, which was passed in 2002. The Act is intended to protect marine wildlife and habitat by establishing large zoned ocean areas, managed for multiple uses but protected with environmental objectives. The most stringent protections offered by an NMCA might include no-fishing and/or no-trespass zones, while in other areas only the extraction of non-renewable resources might be prohibited while other activities continue as usual. Parks Canada intends to create one NMCA in each of the 29 marine regions that make up Canada’s three oceans but to date only 4 exist. The feasibility study for the southern Strait of Georgia is exploring how to zone some of Canada’s most heavily used marine areas for different levels of protection, along with management strategies for protecting species at risk, such as the Southern Resident orcas, and special habitats, such as Saanich Inlet’s glass sponges. 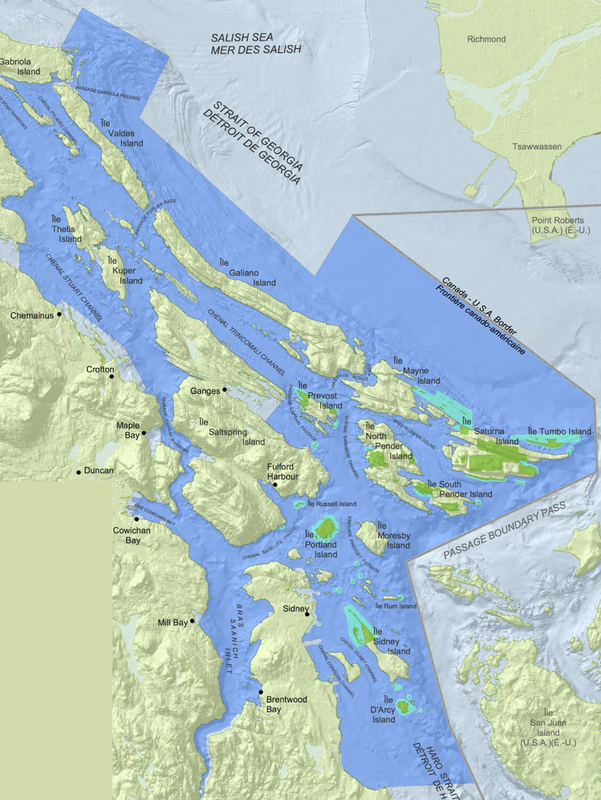 Initially the study area encompassed approximately 900 square kilometres, from Haro Strait to the waters of Active Pass, southern Trincomali Channel and the south shore of Salt Spring Island, and Saanich Inlet. After a public outcry and based on ecosystem boundaries, it was expanded to a larger area of protection, which includes the area from Haro Strait to Gabriola Passage. Environmental groups, including Georgia Strait Alliance, strongly support the creation of an NMCA that includes the larger area Indeed, this larger area will be boundary around which further consultation with First Nations and communities will take place. Continued review of zones of protection in the proposed NMCA and government to government discussion with the many First Nations in the area are underway. Read more about the Orca Pass International Stewardship Area proposal in Wave of the Future, our past international effort around marine planning in the region. 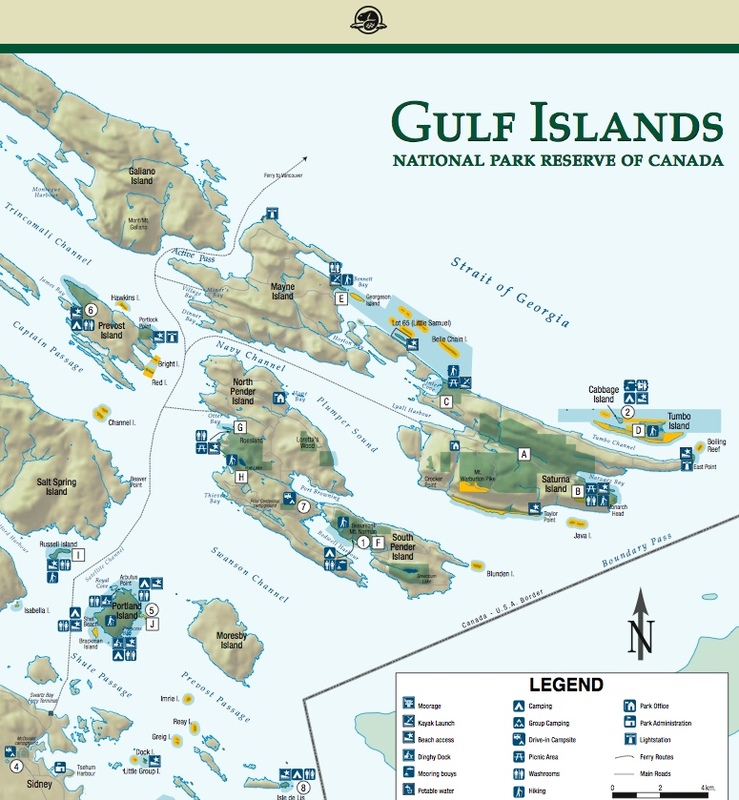 In May 2003, Canada and British Columbia formally established the Gulf Islands National Park Reserve. 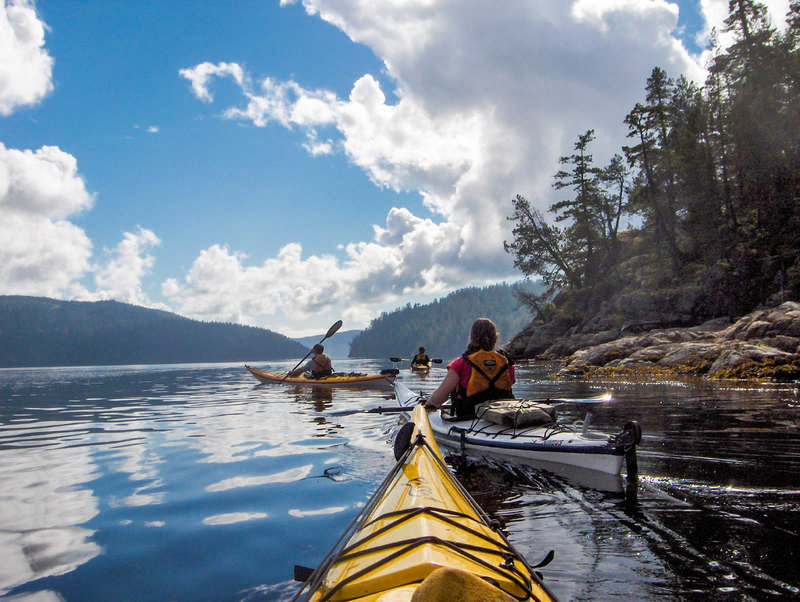 Canada’s 40th National Park, it protects 35 square km of ecologically sensitive terrestrial and intertidal areas, spread out over 15 islands, along with 26 km of marine areas. The National Park Reserve was pieced together on lands purchased and donated since 1995 under the federal/provincial Pacific Marine Heritage Legacy program, which aimed at achieving a comprehensive network of protected areas within one of the Canada’s most rapidly developing regions. A contiguous section of central Saturna Island forms about 45% of the Park, along with portions of North Pender, Mayne and Prevost islands. The Park includes wetland and riparian areas, coastal bluffs and dry, shallow-soiled woodlands populated with Garry oak, arbutus and Douglas fir. 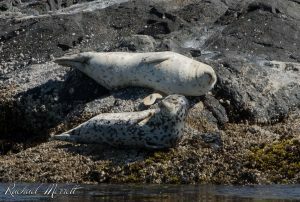 Portland, Russell, Cabbage and Tumbo Islands, Beaumont, Sidney Spit, Isle de Lis, and Princess Margaret Marine Parks are among the more than 30 islets and reefs included in the Reserve. Though small, they are important ecologically. These isolated islets represent some of the best remaining examples of relatively undisturbed vegetation in our region, and allow for the protection of critical seabird nesting and roosting habitats and seal and sea lion haul outs.